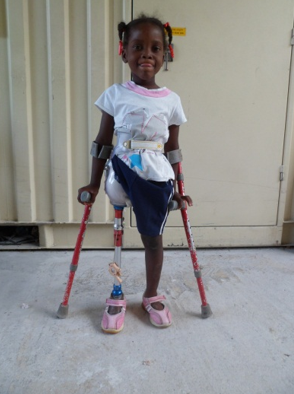 A few months after Bethsina was born the 2010 earthquake struck Haiti, hitting her house and resulting in a wall falling on her. When she was able to be rescued and taken to the hospital, it was found that it was necessary to amputate her right leg above the knee. Following the amputation and several months of physical therapy she was referred to a prosthetics program and fitted with an artificial limb. By the time she was 3, she found that she could no longer use the limb and discarded it in favor of crutches. She was living in Diquini quite close to Adventist Hospital, when one day one of our staff spotted her with her mother. He asked them if she had an artificial limb and they told him that although she had one, she could no longer use it as it was painful and uncomfortable. They were urged to come to the World Rehabilitation Fund/ProsthetiKa program where she was evaluated by rehabilitation staff. It was found that there was injury to the stump and fit her with a pelvic belt to correct the position of the stump and remediate the progression of the contracture. She was then provided with a new artificial limb. At first, Bethsina had difficulty adjusting to the new limb, but with training she became adept to its use. She told staff that she was now very happy to be able to walk with her new leg and not feel any discomfort.